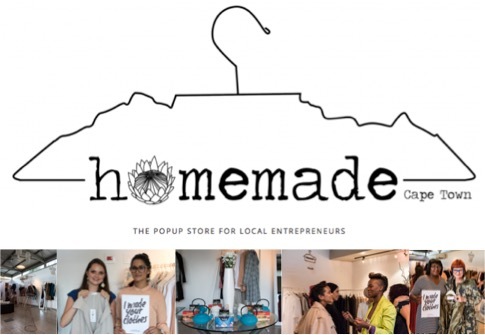 On the evening of the 20th April 2016 Homemade CPT launched “Touch the Skye Pop-up Shop” in Johannesburg with a Tea Soiree in the Sandton Skye setup studio in Johannesburg. Event organisers Leila Bardien-Taylor and Nabilah Hassen-Bardien continued to forge forward with their emerging pop-retail platform by creating a conceptual space as a local design collaborative which includes local artist installations. The concept evolved around textile collage and intricate structures incorporating Eleven Hundred ceramic crocheted lampshades by Lesley Tuchten as the focal point, complimented with a branded fashion commission piece by wireart sculptor Jeff Mwazha. The Z-rail concept used to showcase designers fashion was fabricated by RR Steelworks in Cape Town. Event sponsors included Laager Tea who provided a delightful selection of rooibos teas to suit the specially prepared high tea desserts by Codfather Restaurant’s head patisserie Chef, Chloe van Eyssen. Approximately 50 guests attended the intimate launch which included various magazine editors from Rooi Rose, Glamour, Starved and Wanted. The VIP Fashion list included Alan Foley & Krishen Samuels, Londiwe Mobhele (iFashion), Media Presenters Danine Naidoo, DJ Fikile,Wardah Hartley and Ranaa Patel. The collaboration between established boutique designers such as House of Bespoke by WH and Label Collections with home based studio designers mentioned below revealed unique yet classic statement pieces. Local fashion designers were able to showcase a combination of pieces from current winter collections, with certain previous season items, reminding consumers of the possibility as well as longevity in building a local designer wardrobe and thereby separating themselves from fast fashion. House of Bespoke participated in the Cape Town Pop-up and decided to join the Johannesburg concept featuring the Minimalist Collection personally represented by the creative designer Waseefa Hutton. Label Collections by Nadia Turton is also participating in the event with her capsule winter garments but unfortunately unable to be present due to her boutique commitments situated in the well renowned suburb in Sea Point, Cape Town. Homemade CPT offered to represent her brand. A key style portrayed at the platform through a natural path of networking and brands moving forward from Cape Town were Gadija Khan Designs and Mod-ish. These two brands are well renowned within the national modest fashion community and makes it clear how style is able to transcend a preset fashion identity to reach all fashion keen individuals. During the Cape Town event the perfect accessory to the simple modest silhouettes was the uniquely crafted leather belts and neckpieces by Anna&Yummi venturing alongside to Johannesburg. Mod-ish revealed their eagerly anticipated Bohemian Collection continuing their signature of utilising exotic global style elements. Warm colour palettes trimmed with unique decorative elements which expand on the concept of fashion relevance rather than trend. Gadija Khan Designs provided a carefully selected array of detailed fabrics in her signature style silhouettes which have become a key component, not only in terms of modesty but for those looking for an understated yet glamorous style. The timeless feminine label Phi Casa showcased a collection consisting of predominantly tailored garments which are not only interchangeable alongside an existing wardrobe but also exceptionally versatile and relevant in today’s modern day woman requiring transitional style. An exciting reveal at this launch was the merged territory between Human Image and Gadija Khan Designs on a label called Humane, resonating from their collective sense and appreciation for humanity. The collection consists of luxurious knitwear sourced from locally sourced yarns to production. The project spanned over a period of 8 months during which the team worked closely with all stakeholders, leading to the first capsule collection of knitwear items. The yarns consists of high ratio content cashmere, kid mohair blended with wool left undyed which not only exude the beauty of this natural, untainted form of the fibre but also eradicate the impact on the environment of the harsh dye process. Styles included wraps, cable knits and full length cardigans. The Touch the Skye Pop-up Shop runs from the 20th – 24th April 2016 at the Sandton Skye, 2 Stan Rd. Be sure not to miss out on an intimately welcoming shopping experience while it is here.